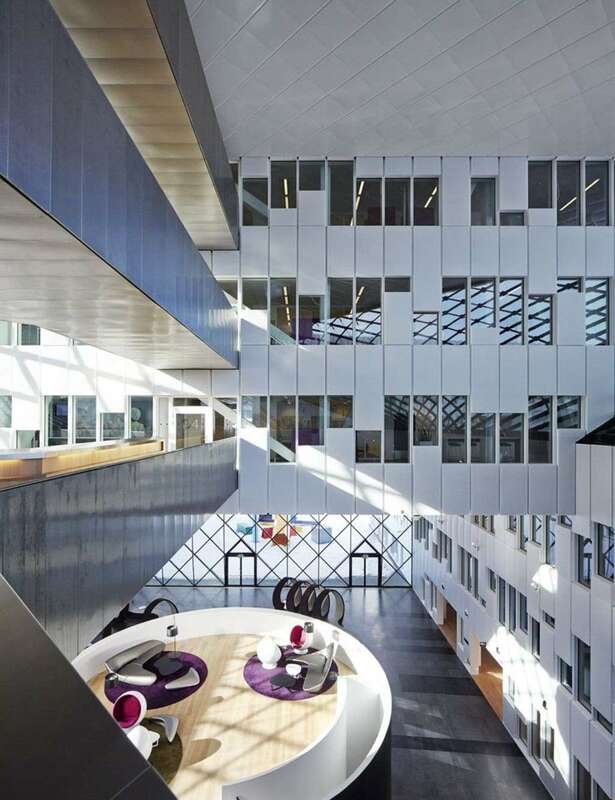 The shape and expressive surfaces of the Norwegian energy company Statoil's office complex reflect the research and innovation that are the keys to the company's operations, achieving significant results in the area of sustainability. A-Lab Arkitekturlaboratoriet's project won the competition held in 2009. The winner of the competition for the construction of the new headquarters for Norwegian energy company Statoil is a project by A-Lab Arkitekturlaboratoriet AS which combines research into the forms of contemporary architecture with a focus on sustainability and the total impact of the building on its surroundings. Located outside Fornebu, home to Oslo's main airport until 1998, the building balances a drive toward invention with the need to fit into its surroundings in a rapidly growing residential and commercial neighbourhood. The Statoil office building was designed to be a reference point with a strong visual impact, a landmark that would help people find their way around and distinguish the suburban landscape. Making the building an icon of what it produces was the idea the architects pursued as they attempted to arrange 117,000 sqm of office space over the waterfront of the fjords in Fornebu, an area of great natural beauty. And so what used to be an airport parking lot was filled in with a volume composed of five identical rectangles 3 storeys high, 140 metres long and 23 metres wide. Stacked in pairs on the basis of a design vaguely recalling the game of pick-up sticks, the buildings on the same level were rotated in relation to one another to add dynamism to the whole, varying the angle at which light strikes their inner and outer surfaces. The fifth element standing above all the others has its fulcrum in the centre of the area formed by the other four buildings. This big foyer leading to the various levels is a covered outdoor area which people are encouraged to pass through, meeting and talking while there. Looking upwards from here, we are struck by the imposing structure with its complex organisation and high impact, high-tech cladding. In the same way, the surfaces surrounding the foyer, like those of a city plaza, are enriched with different lookouts, bridges and balconies from which to enjoy the view over the open space in the centre. From here the internal paths continue to the various floors in the building via a central tower connecting them from the outside and four concrete blocks containing stairs and lifts acting as hinges between the horizontal volumes. The prefabricated concrete and steel structure has parts overhanging by as much as 30 metres. Its internal and external cladding of aluminium panels incorporates windows, systems for insulation and for screening light, concealing all connection systems to create clean surfaces and present the building as an icon of efficiency. A complex modular grid of glass with a spiral shape forms the roof of the space formed where the volumes on different levels come together. Reduction of energy requirements achieved using heat pumps and insulation systems such as triple glazing with a very low transmittance permit use of energy from renewable sources.